The relationship between Bolivia & Football is like that of Sonny & Cher, Strawberries & Cream, or Americans and Twinkies. So, in honour of the recent FIFA© World Cup® I thought I’d better do a football post. In Australia, every aussie knows they’re a sports fan because they buy big screen TVs and yell at their kids on the field every weekend. In Bolivia, everyone knows they’re a sports fan because, well, there’s a significant chance they’ll get killed if they’re not. Players have been stabbed before for missing goals. It’s kind of a big deal. The President even plays against other Latin American leaders, but that’s mainly for PR. If you can’t win them over with a lack of firepower and a GNP equal to that of Bosnia’s, just beat ’em at high altitude football I say. You can call it soccer if you like, but you’d be an idiot. Just like Americans call gridiron ‘football’ instead of ‘3 hours of time-outs and dropped passes by people that get paid more than Bolivia’s and Bosnia’s GNP combined.’ If you want that kind of football, move to Australia. They don’t play with pads or helmets or time-outs, and sometimes their faces aren’t all in in one piece by the end. One guy played with a fractured eye socket the whole time. His grade 3 classmates were very proud. I don’t actually remember any other sports that made much of an impact in Bolivia. Other than racquet ball I guess, which was like squash for women, or invalids. I put myself in both categories. The Brazilians introduced Beach Volley Ball, with limited success. Bolivia has no beaches, and ‘concrete bronx volleyball’ didn’t have quite the same appeal. When we lived in the city my brother and I used to duck next door to the Norwegian school and play football with them. They had Magnus on their team. His name meant ‘neckless truck’ in Norwegian. I could understand how his ancestors were able to ravage villages. The guy must have started shaving in grade 2. Thankfully Magnus was always in a good mood and no one got eaten. It’s possible he provided the voice for Optimus Prime in the transformers movies. Or the stunt double. Playing against a bunch of pale european kids with shoddy english was one thing, but sometimes they invited Bolivians and things got C-razy. The Bolivians had these amazing moves, like El Escorpión, (the scorpion) where the goalie jumped on his hands and kicked the ball away with the back of his heels. If you missed you looked like an egocentric idiot; teeth jammed into the dirt, clavicle somewhat disengaged from the wholeness of reality it was used to. But if you pulled the move off you were enshrined in football glory. The Bicycle Kick (bicycle kick) was awesome too. You kicked the ball backwards over your head as you did a backflip. I say you because it sure wasn’t me. For me, just getting my foot to connect to the ball was progress enough. By this stage my $2 Reeboks were more like $2 laces with the occasional piece of shoe clinging on for dear life. Mum said once I got real shoes the hard training would pay off and I’d be kicking higher and farther than kids twice my age. If my feet ever healed and I learned to walk again, without the hindering effects of people crying and throwing coins at me. Football is like the lifeforce of Bolivians. They don’t need an excuse or a field to play, so long as it’s flat enough so the ball won’t roll by itself and there’s something vaguely resembling goal posts in place. A position usually reserved for sisters, in the absence of anything solid. They don’t even need light; I’ve played games where all you could see was the moonlight shining off the keeper’s switchblade. Football games in Bolivia were cultural affairs and finished long after the ref’s whistle blew. If Cochabamba won an interstate game on home turf there was partying in the streets for like 24 hours. The entire length of the plaza was filled with revelers filled with beer filled with who-knows-what. 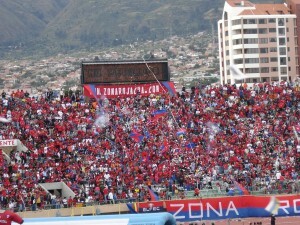 The most popular local team was Wilstermann, winners of last year’s ‘that doesn’t even sound remotely Bolivian‘ awards. No, they were named after Jorge Wilstermann, a Bolivian aviator. He must’ve done something right, because they named both the team and the local airport after him. But, as is my habit, I digress. At Wilstermann games, everyone was a rabid Wilstermann fan whether they wanted to be or not. The other team usually had a few supporters straggle in late, ashamed at their poor life choices and fearing death. They got pelted with coke bottles if their team ever scored. There were police near the field to protect the players, but the fans usually got heinously bashed. My brother, in a long line of mishaps involving self-harm, was an Aurora supporter, and came home from games with with all kinds of things embedded in his skull. The crowd used to throw all their bottles and drink cans on the field at the players should things be going badly. Unopened if the score was real bad. An empty bottle to the face is a visit to the infirmary. A full one meant you ate mashed banana the rest of your life through a straw. 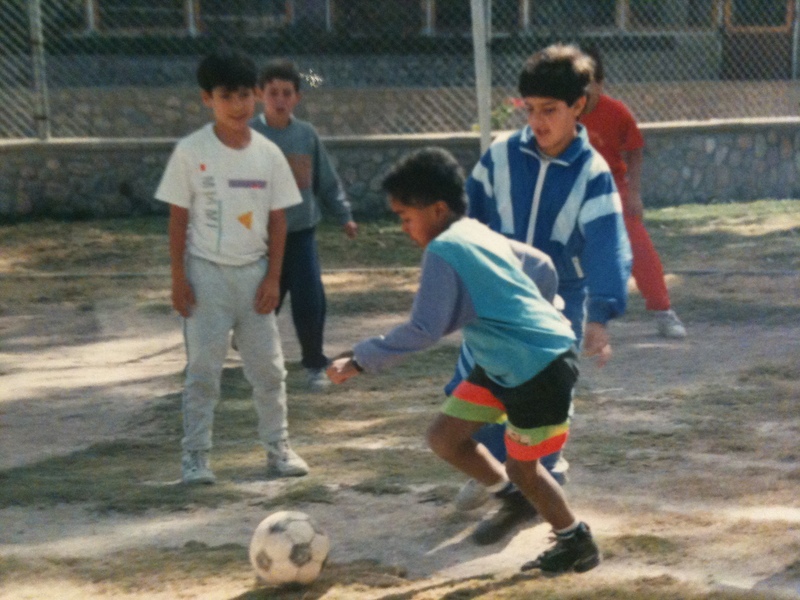 Football at school was (thankfully) never quite that intense. The Bolivian kids always won, so they mixed the teams up. I got put on defense because I was crap and had no desire to get kicked in the nether-regions, a clear and present danger when playing any sport. Perhaps one day Bolivia will get a decent spot in the World Cup and be bathed in glory, and featured in TV montages including scorpions and bicycle kicks. They did get to the semi finals some years back. Until then, we cross to a breaking poll about very important things. Magnus will eat you if don’t vote. Just what should it be called? Scientific rationale for a better tomorrow. Posted in Bolivia, CultureTagged bicycle kick, football, norway, Norwegian, optimus prime, scorpion, soccer, sport, transformersBookmark the permalink.